We often see white clouds floating in the sky and imagine so many things about them. We visualize them as rabbits, swans and sometimes they seem to take the shape of an elephant too especially during the rainy season when the sky is overcast with dark clouds. But we are not aware of another unique type of clouds known as Cumulus Clouds. The word cumulus has originated from the Latin word “cumulo” which means pile or heap. Quite often the words “fluffy”, “cotton-like” or “puffy” are used to describe these clouds as they look like floating cotton. They belong to the Clouds with Vertical Growth group. The base of these clouds is flat and they are low-stage clouds so that they generally float less than 1,000m or 3,300 ft above the ground. Cumulus clouds may appear anytime on their own in clusters or in lines. They may rise above this level if they are more vertical which are referred to as cumulus congestus in form. When the air above the ground becomes warm it rises up carrying water vapor with it by the process of evaporation. When the warm air rises higher as it is light it meets cooler air, super cooled water droplets or even ice crystals and the warm water vapor becomes colder and condenses to form clouds depending on the surrounding temperature. 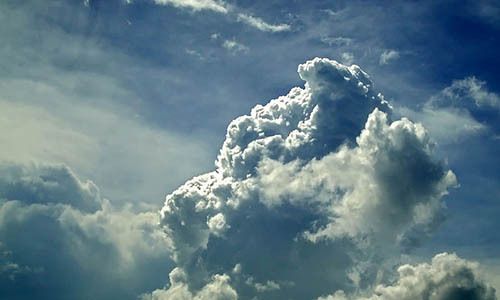 Cumulus clouds are the first stages of other types of clouds. They take different forms that are distinct in shape and size as well as content and cool the earth’s surface by reflecting the heat of the sun. There are many factors that influence the different formation of cumulus clouds like instability, temperature gradient and also moisture present in the surroundings. Cumulus clouds usually do not produce any precipitation but they have the chances of growing into water-laden clouds. The top of the clouds often have rounded towers. When the top of the cumulus clouds takes the shape of a cauliflower head, they are known as cumulus congestus or towering cumulus. Hence cumulus clouds are considered to be part of the larger category of cumuliform clouds that are free-convective in nature and include these cumulonimbus clouds. These are thunderstorm clouds and grow upwards vertically. The flat base of these clouds is mostly 300 m above the earth’s surface. But the top of the clouds extends higher and may grow up to more than 12,000 that is 39,000 ft high and have sharp outlines and their width is about 1km. White and puffy cumulus clouds forecasts mainly fair weather and that there are no chances of rain right then in other words Cumulus Humilis clouds are associated with fair weather. But if they grow bigger and the color changes into gray then rain is expected. Cumulus Congestus clouds forecast bad weather. Light to heavy showers can be expected when their tops take the form of the head of cauliflower. The cumulonimbus clouds contain high levels of energy that are released by the condensation of water vapor. Lightning, tornados and violent thunderstorms are expected when cumulonimbus clouds are seen in the sky. Cumulus clouds that herald fair weather are fueled by bubbles of air or thermals that move upwards. They have sharp defined edges and bases when they are in their first stage. The older cumulus clouds have a ragged look as if there has been cloud erosion.